Electrical systems are built to continuously match the supply of electricity to customer demand. On a minute-by-minute, daily and seasonal basis our demand for electrical energy peak goes up and down depending on demand changes such as turning off and on lights, TVs, baseboard heating, stoves etc. To meet these changes in demand, the electrical system must have enough capacity to supply energy exactly when it is needed. As well, there needs to be enough stored energy to meet upcoming needs for future demand. Electricity generation is measured via two related but different measures: energy and capacity. Energy is a measure of power used over time and represents the “work” that could be done. For example, a 1 MW plant that operates for 1 hour is said to have produced 1 megawatt-hour (“MWh”) of energy. Capacity is a measure of the ability of a given power source to produce power, typically measured in watts (“W”), kilowatts (“kW”), or megawatts (“MW”). The difference between energy and capacity is important to understand and key to thinking about the requirements of an electrical generation source. Put simply, energy is what we consume to do work (e.g. cook food, light & heat our homes) and capacity is the assurance that the energy we want to use is instantly available when energy is required. The image below shows a reservoir with 40MW total capacity. The bottom half of the tank represents winter capacity. In this case only 20MW of capacity is available in the winter and all 40MW is available in the summer. When capacity is released and put to use it turns into energy. When the energy needed exceeds the capacity (at peak times) held in the tank then other energy sources are needed. These energy sources must be dispatchable (see below) in order to meet the short-term peak need. 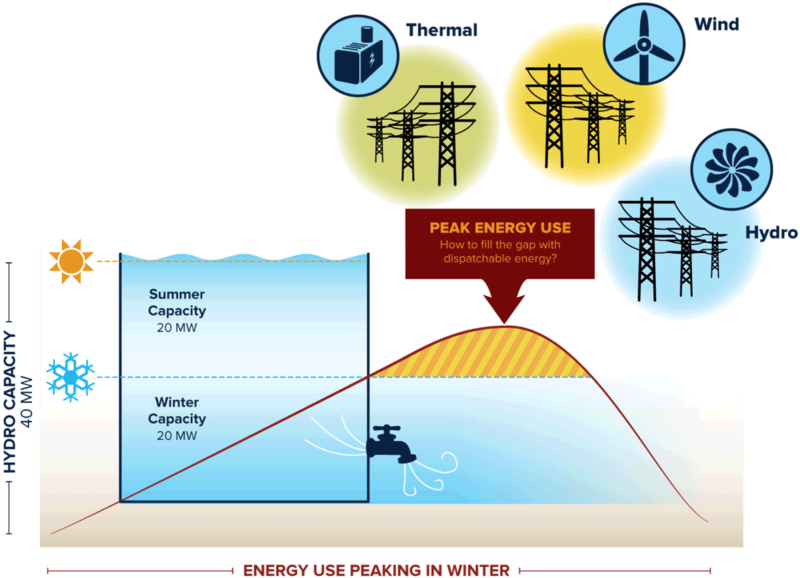 Electric generation sources (hydroelectricity, wind, solar, diesel, natural gas) can be thought of in terms of their ability to supply energy on a longer-term basis, and their capacity to provide energy when the energy is needed (peak times). Generation sources that can be called upon at any time to generate electricity are said to be dispatchable. These dispatchable generation sources have dependable capacity and deliver what is called firm energy because energy is consistently available when required. Examples of dispatchable generation sources that provide larger quantities of “firm” energy are hydroelectric projects with water storage, natural gas generation and diesel generation. Generation sources that generate electricity only when their fuel supply is available, and not necessarily when the energy is needed, are called intermittent generators. Examples of intermittent generators are wind, solar power and some run of river hydro projects. Another important characteristic to consider when comparing different generation options is the speed at which various power sources are able to turn on and off and to change generation levels (e.g. ramp up and ramp down). For example, coal and nuclear plants need days or weeks to start-up and shut-down. These power sources are run to meet “base loads” or the constant amount of power needed on any given day. Other generation options, such as hydro-with- storage, simple cycle gas turbines, and natural gas reciprocating engines, can be dispatched quickly to meet short-term changes in demand for power. For example, they can be ramped up to provide lots of power in the morning when everyone wakes up, and ramped down once everyone goes to work. These variable types of generators have the ability to change the amount of energy supplied frequently in response to short term (e.g. hourly, daily) changes in demand.